Posted April 8th, 2019 by alexa & filed under Families. I do so many Vacation Photography Sessions in London and absolutely love them! I enjoy meeting families from all over the world and photographing them spending quality time with their loved ones. I’m always happy with the varied selection of images we can get in the family photography session. But sometimes there’s one image that I just love and keep coming back to again and again. 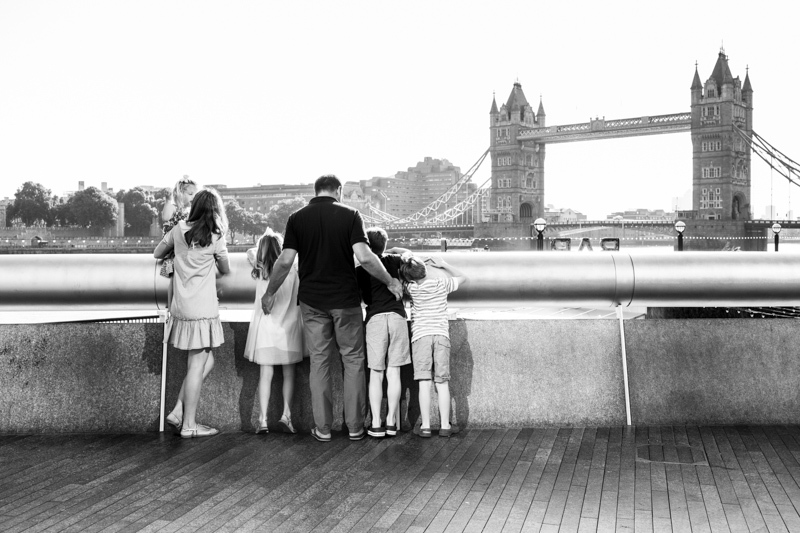 This family vacation photo at Tower Bridge is one of those images. I’m not sure exactly why I like this vacation image so much, so I’ve been trying to work it out! I think the first and main reason is that this American family were absolutely lovely! This vacation photography session was one of three I did with them. They had been living in London for a few years and were about to move back to Chicago. Before their London adventure ended they asked me to take a series of professional images of them. They wanted some natural family photographs of them enjoying time together in their favourite London locations. Another reason this image is so pleasing to me is that I think Tower Bridge is absolutely stunning. It’s beautiful to look at and I’m lucky enough to have photographed a wedding inside the bridge. Just follow this link to see some wedding photos from that amazing day Tower Bridge Wedding Photographer To see this family taking in the view across the River Thames towards Tower Bridge and enjoying being together was pretty special! If you’re coming to London on holiday and would like to go home with a fabulous set of professional photos, please do get in touch. I can suggest some great locations for your London vacation photography session. And we can include lots of the London landmarks in the images that will always remind you of your holiday in this fantastic city. And not only that – it will also be lots of fun!